The following list contains the countries with the largest water area in the world. The water area is the sum of the surfaces of all inland water bodies, such as lakes, reservoirs, or rivers. Territorial waters are not included. 1. Canada – 891,163 km2 (344,080 sq mi). The second largest country in the world has the most water in the world. 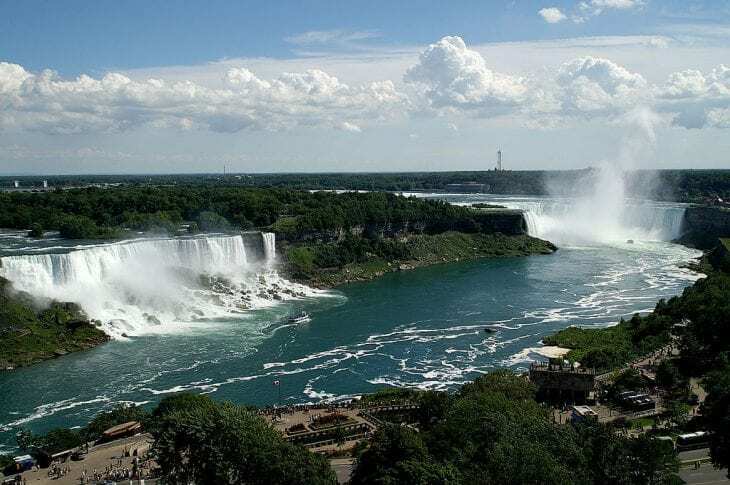 Water occupies 8.93% of the total area of Canada which shares the five great lakes with the United States. Those lakes are one of the main reasons Canada made the top of this list. 2. Russia – 720,500 km2 (278,200 sq mi). Russia is the largest country in the world and only 4.21% of its area is water. But that’s enough to put it in this list’s second place. 3. United States – 470,131 km2 (181,519 sq mi). Just 2.23% of the world’s fourth largest country in the world is water. The great lakes it shares with Canada are responsible for much of that water. 4. India – 314,070 km2 (121,260 sq mi). The 7th largest country in the world has 9.55% water area, putting it in this list’s 4th place. 5. China – 137,060 km2 (52,920 sq mi). 6. Iran – 116,600 km2 (45,000 sq mi). 7. Ethiopia – 104,300 km2 (40,300). 8. Colombia – 100,210 km2 (38,690). 10. Congo (DR) – 77,810 km2 (30,040).